It was a time when rounded verandahs were all the fashion, and the two girls who were old enough to know this convinced their father that a rounded verandah was the thing to have. The little ones looked on in awe as the teak doors were painstakingly carved by hand. Eventually, curiosity would get the better of them and they would play with the sharp wood fragments, only to be shooed away by the old carpenter. 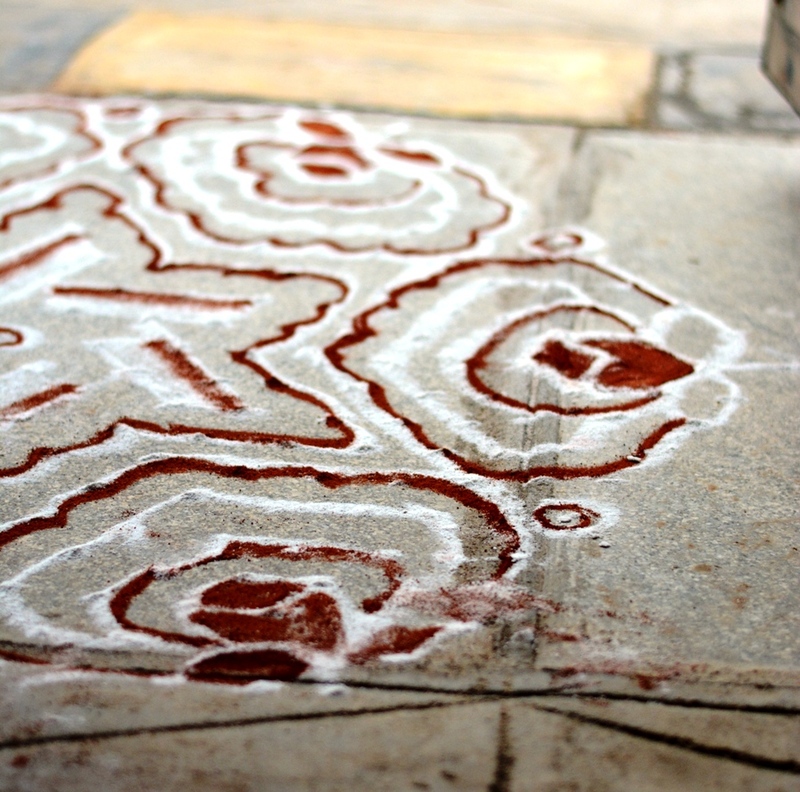 The same teak doors still separate the rooms of the fifty-something year old house, their carved patterns intact, their hue slightly darkened with age. My mother is the fifth of the eight, all girls. The older ones cared for and scolded their younger sisters, in equal measure. Over the years, the solid brick walls absorbed the gleeful chatter, melodious singing and silly squabbles of eight little women. Clothes were bought or home sewn, handed down, fought over and innovatively re-sewn. Nothing was wasted or carelessly tossed away. Pleasures were simple and always shared. A pretty piece of fabric, a small bag of sweets, a new song. Education was deemed important beyond almost anything else. Nooks were claimed for study and the safe-keeping of books. The table, a staircase landing, the stone used to wash clothes upon and the tiny attic above the third bedroom all became valuable study areas where books were devoured and exams were fretted over. As the older girls graduated, their spaces were relinquished to be occupied by younger sisters. Etched into the door of a small cupboard with a knife sharpened with procrastination, is the name of one of the sisters, the surrounding wood worn smooth by the years. My grandparents saw no reason for eight daughters to be any less academically accomplished than if they had been eight sons. Their thinking was progressive for their time and as a result, the house churned out an assortment of doctors, scientists, accountants and teachers. Brass plaques that were nailed into the front door bearing names and once shiny new qualifications still adorn the dark wood. Among the plaques sits the two oldest of them, one bearing my grandfathers name and the other bearing the name of the house. Stairs along the side of the house led up to the open terrace, a common feature of houses of that time. This wide open space was for daytime yoga sessions, afternoon naps on summer days and a makeshift salon where wet hair was dried before it was braided. My grandmother would venture up there to dry chillies and tamarind on large blankets weighed down by rocks. Diwali saw that terrace bathed in a glorious display of light when all the girls would race up there to set off firecrackers. Later, the wrappers would be proudly carried down and piled in front of the house, lest the neighbourhood kids think that eight little girls couldn’t set off their share of explosions. Marriages were arranged or beaus were found, kept secret, breathlessly whispered about and finally disclosed. Weddings were organised, the youngest still giggly schoolgirls excitedly watching their akkas (older sisters) move away with the men they chose. Later, there were grandchildren. Small, sprightly offspring who would climb the bars surrounding that rounded verandah. Quieter little ones who would curl into those same nooks with story books. Aunty Jyothi, the very daughter for whom the house was named, lives in that house now with her family and so two more daughters have been raised between the solid walls, fed from the same kitchen and have crammed for exams in the same rooms. During my recent visit, my cousin Chaitra and I spent a morning cooking in the kitchen of the house our mothers grew up in. It was apt, and terribly exciting that she taught me to how to cook one of my favourite vegetables. Thondekaye (Ivy Gourd), resembling tiny cucumbers, is available only in frozen form in Australia, although those in the UK can find it fresh in Indian stores. 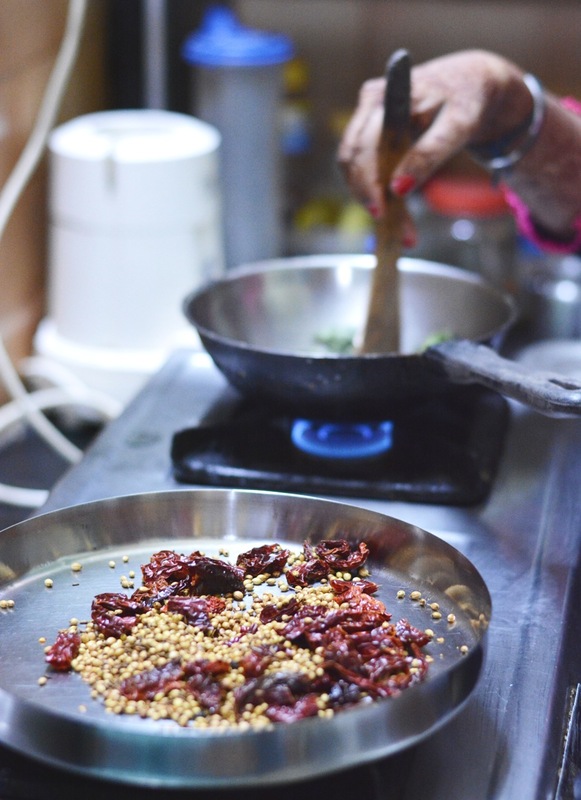 My love of it is widely known amongst my mum’s side of the family, meaning that many of my aunts will indulge me by cooking me a thondekaye dish whenever I visit India. 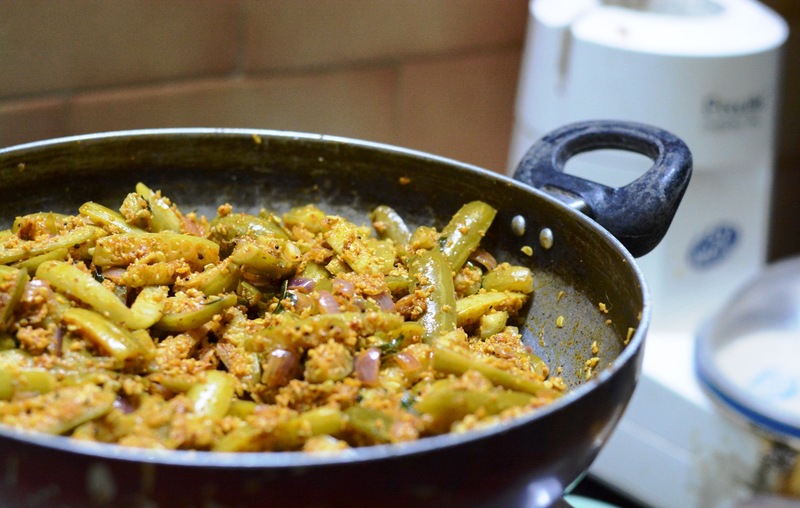 So when Chaitra, who has flourished into quite the cook, offered to teach me how to make this Manglorean Thondekaye Sukha (dry stir-fry), I was in. It is important to cut the whole thondekaye lengthwise, into quarters or sixths. What happens is that each piece curls lovingly around the spiced coconut matrix, the flavours settling nicely between the internal ribbing. The sharpness of chilli, hint of jaggery sweetness and sour notes of the tamarind are offset by the freshness of the coconut, and the tiny thondekaye wedges are the perfect vehicle for this intricate mixture. That morning, my cousin and I cooked, giggled, chatted and cooked some more. 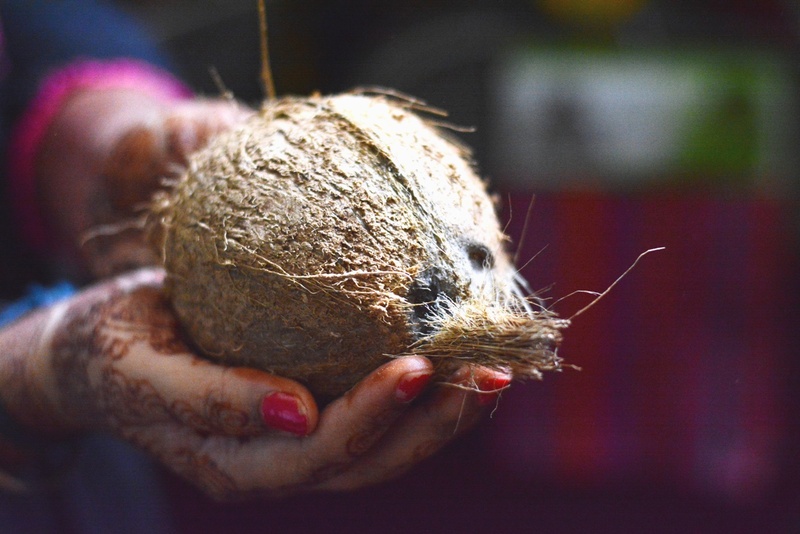 I chopped as Chaitra grated fresh coconut. She roasted spices to fragrant perfection while I soaked tamarind. Each step was patiently explained to me while I madly scribbled it all down. So it was that we added new memories to the fifty-something year old kitchen. And the gleeful chatter of two more women mingled and were absorbed into the walls of the house with the rounded verandah. Break up the tamarind and soak in 1/2 cup of boiling water in a medium sized bowl. Mash with a fork and leave to soak until the water is cool enough to touch. Then, with clean hands, squish the tamarind in the water until the water thickens. Strain the water into another bowl. The tamarind flesh can be discarded or stored in the fridge and used again within a few days. Slice the thondekaye lengthwise into quarters or sixths, depending on how thick they are. Frozen thondekaye usually comes pre sliced. Immerse in salted boiling water and bring to the boil again. Simmer on low-medium heat until the insides are tender but the skin still has a bite. This will take 5-7 mins for frozen thondekaye, and longer for fresh. In a large non-stick pan, warm 1/4 tsp coconut oil. Add all the spice mix ingredients except the curry leaves. Roast on low heat until fragrant and until the red chillies become brittle between the fingers. Transfer the mixture to your mortar and pestle or spice grinder. In the same pan, roast the dried curry leaves for a minute or so and add to the other spices. Grind to a fine or slightly coarse powder. In the same large pan, heat 2 tbsp coconut oil. Lower the heat to medium and add the mustard seeds. Take care not to burn them! When they have popped, add urad dhal, turmeric, curry leaves and garlic. Stir-fry for a minute or so on low-medium heat until the dhal has gained a little colour. Add the spice mixture and stir-fry for about 2 mins. Then, add the diced onion and saute until translucent. Add the coconut and toss to mix. Pour in the tamarind water and sprinkle in the jaggery and 2 tsp salt. Mix well and cook for a further minute. Drain the thondekaye and add to the pan. Stir-fry for another 5 minutes. Taste and add more salt if neccessary. If the thondekaye is still a little undercooked, cover and cook, stirring intermittently, for a further 5-10 mins. The thondekaye should be tender and yielding but not mushy. Sprinkle with coriander, if desired, and serve with chapatis or mixed into rice with a little more coconut oil. Jaggery is unrefined Indian sugar and can be found at Indian grocery stores along with frozen thondekaye, coconut, the spices, urad dhal and dried tamarind. Jaggery has a unique flavour but if you can’t get it, soft brown sugar should work. You can of course use powdered spices instead of whole, but believe me when I say that when you start powdering your own spices, you will never want to go back to pre-powdered ones. What a wonderful post. Beautiful pictures. Beautiful words. Well written preamble Deepa! Keep it up. While reading your post old sweet memories came one after other line a slide show which made me very happy! Thank you so much aunty. Am really happy that you liked it, was more nervous about this post than I usually am! What a great post – you have a beautiful way with words. The pics are gorgeous too. 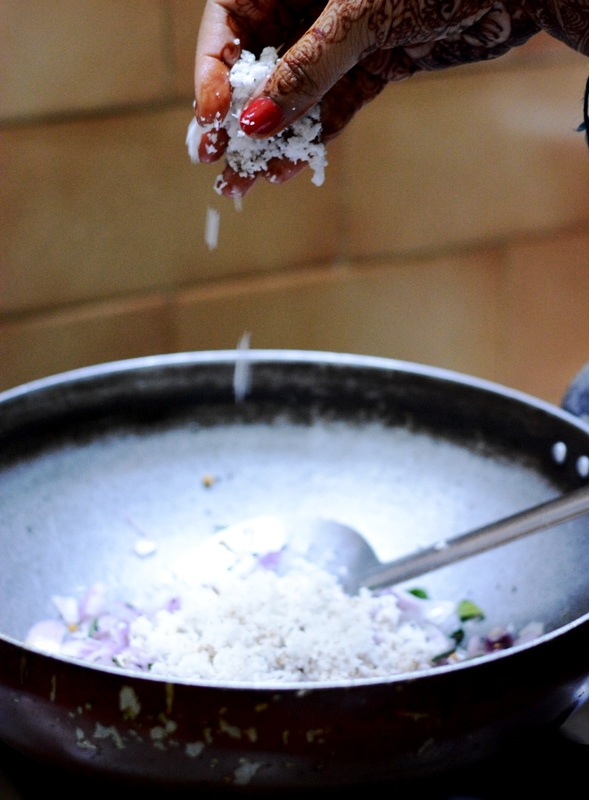 I relate to the manglorean cuisine quite a bit being a maharashtrian from the konkan coast. I love the coconut addition. Thanks so much Archana….I was thinking I haven’t heard from you for ages. Hope you have been well. I see you’ve given your site a makeover. …looks lovely! There was a month long trip to australia, a job change etc – the come back has been slow 🙂 Thanks for noticing the site. I decided to commit to this blogging thing and hence the new site. 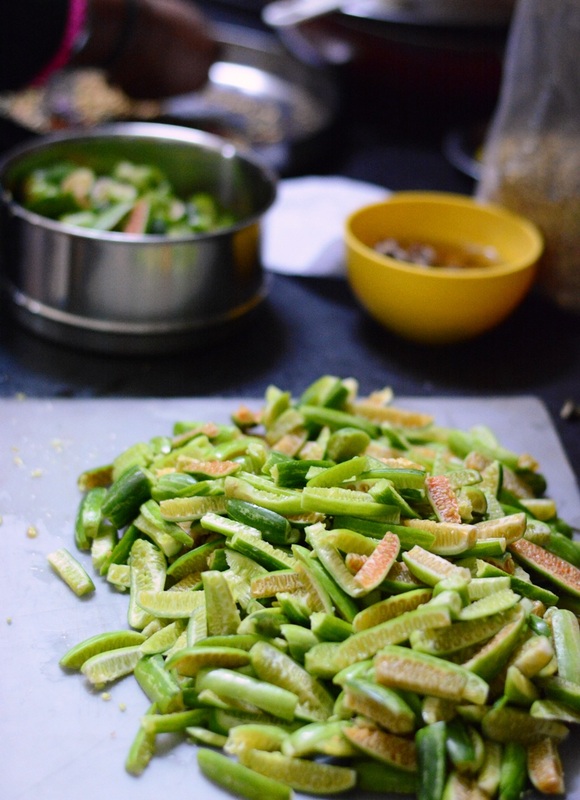 My mom makes a very simple ivy gourd stir fry that I absolutely love. I am going to try this version next time. We get fresh ivy gourd here in the Bay Area so that’s pretty awesome! Also, love the background story! Again, jealous that you get it fresh! I used to make a simple version too but this dish has upped the ante for me. Try it if you get a chance 🙂 And thanks. Your absolutely right Education is really very important.. 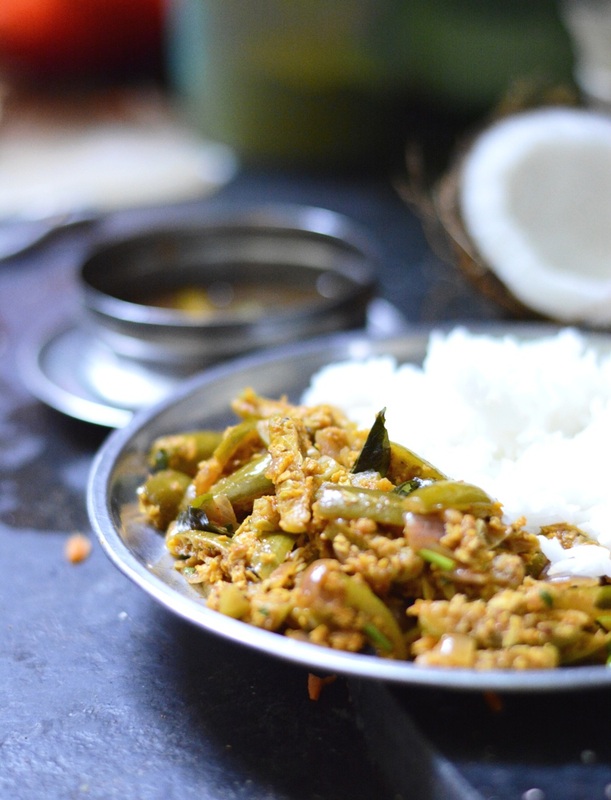 Without it cant read your recipe about Thondekaye Sukha (Ivy Gourd and Coconut Stir-fry). Hope that all the ingredients are availbale here ain NOwra Australia. So I can make it. Nowra! Awesome. ….I hear it’s pretty there. Do you have an Indian shop in nowra? If not there should be one in wollongong. Loved this post! It is not often that daughters are treated the way your grandfather treated your mother and aunts. And neither do daughters inherit properties!! Not a fan of cooking or dondekkai but I loved the family and the description of your grandfather’s house! Hi Deepa, I am a friend of your mum. We met at a wedding last year. Also my daughter Kanchan is also a Vet 🙂 You write beautifully. Keep up the good work. I should try out the Dondekaye.. I think in Hindi it is called Tindli.. Thank you so much..
Hi aunty, thanks so much for visiting and for the sweet comment. Of course I remember you and Kanchan 🙂 Do try it out if you get a chance. Thanks Vanita. Manoli sounds lovely too, I must try it. I’m glad I stumbled upon your blog Deepa. The writing is ever so lovely. what a lovely post! made me miss the fresh dondakaye we get in Singapore so easily. Thanks Nags! I wish we could get it fresh here! Gorgeous post Deepa. Beautiful stories and imagery as always! What a lovely read, Deepa. A very special home there – the nooks and cranies, and the lives in them. Your writing brings it wonderfully alive. It certainly is special Pia. Thank you so much for dropping in and for the kind words.